Pineapple is an iconic fashion brand based in Covent Garden and has grown beyond its dance heartland. The brand has been licensed across relevant product categories which provided a rapid route to growth. However this also created strains in ensuring brand consistency. The Pineapple brand was thoroughly understood by a small number of key people. 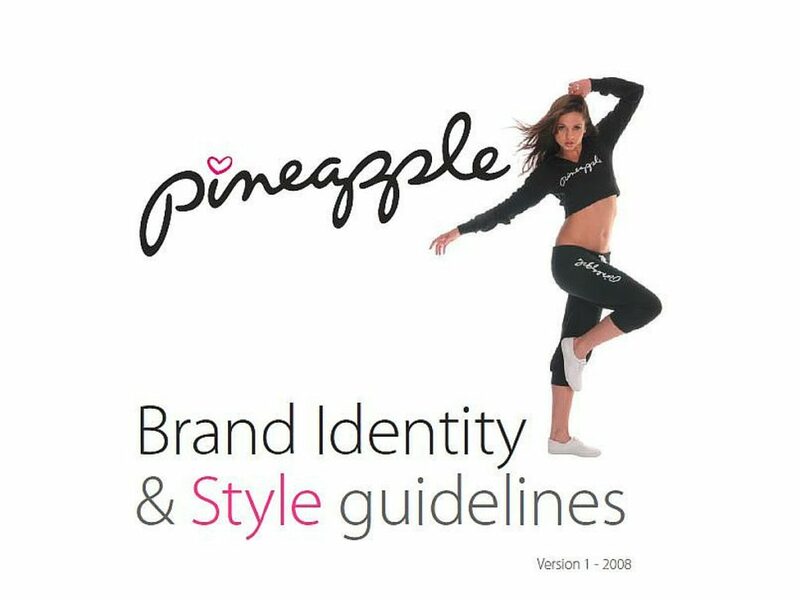 The brand guidelines were needed to ensure that everyone in the Pineapple team shared a common understanding of the brand. From dance studio to clothes and accessories, Pineapple is exuberant, fun and flamboyant. We helped Pineapple to pinpoint what made the brand different and desirable. Big Idea helped to define the Pineapple brand essence and encapsulate the brand guidelines for the licensing team and licensees. We started with a series of interviews – bringing together the brand knowledge inside the business, the perceptions of key licensees, customer groups and consumers. We had to ensure the brand origins and brand story remained intact and authentic. We also wanted to make sure the brand evolved to stay relevant to its key customers. The new logo is built on the signature style of the Pineapple founder, particularly the distinctive heart dotting the ‘i’. At the same time it meets the requirements of licensees for smoother typography that is easier to reproduce across different materials at differing sizes. Having defined the brand essence, the brand style guide helps to ensure brand consistency across selected product categories for licensees.